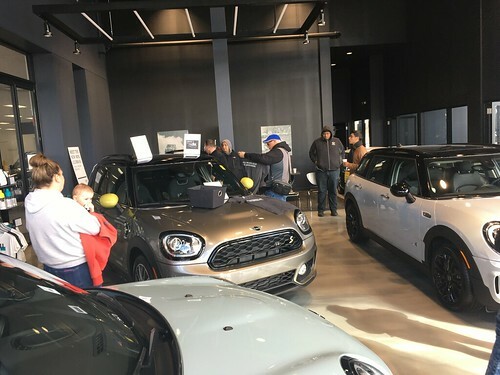 The Chicago MINI Motoring Club has created a handout for members to download and pass on to other MINI owners that aren’t part of the club. It tells them about the club, our activities, and all that we do. It’s a great way to invite any local MINIs that we may see from time to time. You can download the handout the PDF file here. I finally have details on our reception for the other Mini club members that will be in town for the track day. When you arrive at the gate, tell them you are a guest of the Midwest Driver track day. The cost to enter the track is $5. They will give you an armband denoting that you are a visitor. Beforenoon, park in the visitor parking labeled on the map. After noon, you can park in the Novice parking area. Time: 5:00PM-7:00PM, immediately following the end of the track day. If you aren't participating at the track, please arrive at the track at4pmor so. This will ensure that you get in, in case Gateway closes the main gate. This will be a dinner/reception for Midwest Mini club members. There will be several people from the KC club, theChicagoclub, and the Indy club at the track day. Come join us for a meet and greet casual dinner. It's a great opportunity to meet members of other clubs and talk Minis! Food and drinks will be provided. Thanks to the Phil Wicks Driving Academy for co-sponsoring this event with the St. Louis Mini Club! RSVP is requested (send to aaron@stlmini.com) but NOT required. All Mini club members and their families are welcome. During lunch, the driving academy will offer a $10 lead-follow drive around the track open to the public. The time slot for this is11:55am-12:15pm. If you are interested, arrive at the track around11amand go to the media center. Ask to register for the public track session during lunch. The concession stand will be open for lunch. Everyone is welcome to visit the track at any time during the day. You can check out some cool cars (including 15 Minis) and see what the driving academy is all about. The $5 entrance fee lets you in for the entire day. One other interesting note; the last event of the track day is a 5-lap Mini demonstration session. This will happen between4-5pm. We should have around 15 Minis on the track at once! If you have any questions, please let me know. On the day of the event, you can call me at 314-713-1075 if you need info or help with anything. We hope to see all of you there…Motor On!